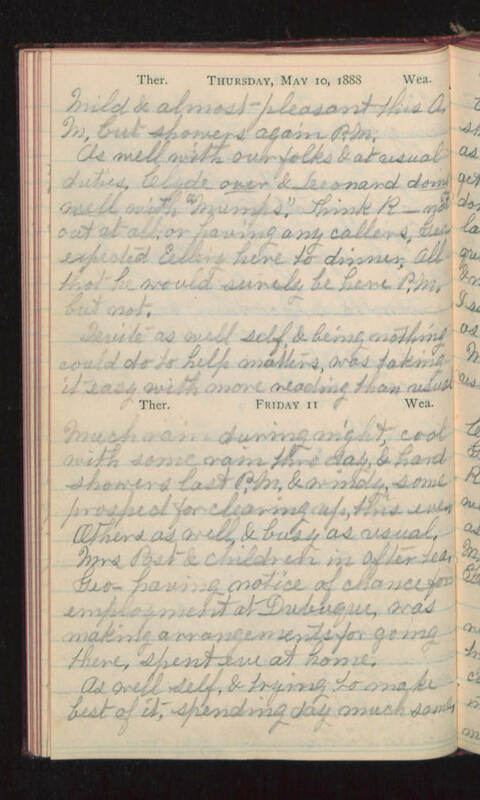 Thursday, May 10, 1888 Mild & almost pleasant this A.M. but showers again P.M. As well with our folks & at usual duties. Clyde over & Leonard doing well with "mumps". Think R- not out at all, or having any callers. Geo- expected Ellery here to dinner, all tho't he would surely be here P.M. but not. Quite as well self & being nothing could do to help matters, was taking it easy with more reading than usual. Friday 11 Much rain during night, cool with some rain thro' day, & hard showers last P.M. & windy, some prospect for clearing up, this eve. Others as well, & busy as usual. Mrs Post & children in after tea. Geo- having notice of chance for employment at Dubuque, was making arrangements for going there, spent eve at home. As well self, & trying to make best of it, spending day much same.